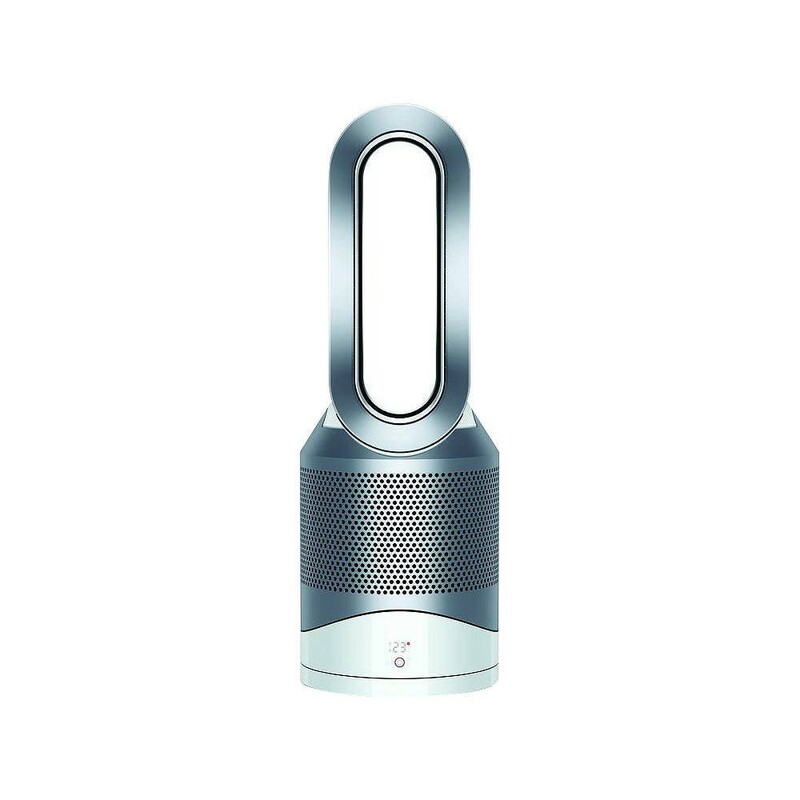 As an all-in-one fan, heater, and air purifier, the Dyson Pure Hot+Cool Link is the ultimate way to keep any room clean and comfortable. Using Dyson’s own patented Air Multiplier™ technology, the Pure Hot+Cool Link generates a constant flow of powerful air while still running silently. The difference in air quality is obvious, but you’ll barely notice the unit itself. 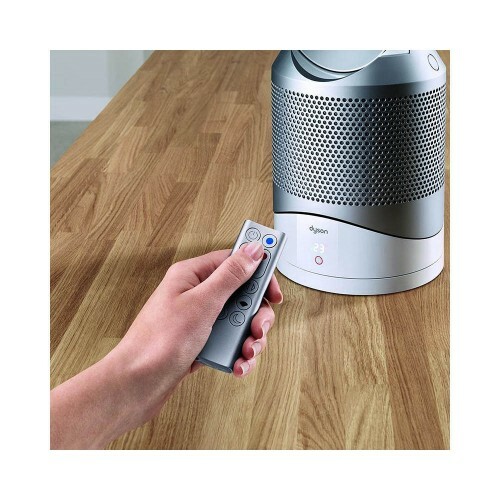 Single-touch oscillation control makes the unit incredibly easy to use, and there’s even an app for remote use. Using a 360-degree glass HEPA filter, the Pure Hot+Cool Link is able to pick up and remove over 99.5% of pollutants from the air in your home. From pollen and pet dander to dust and bacteria, the powerful filter can cope with even ultrafine particles. It also comes with active carbon, so it can also remove unpleasant odors and chemicals from the air, too. 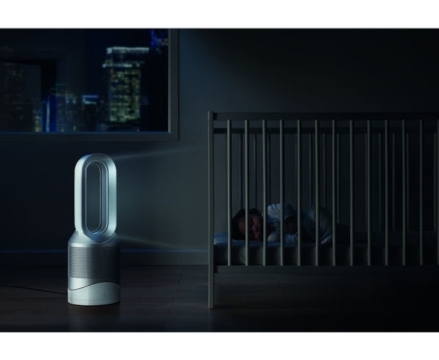 It works automatically to keep your air clean and clear, and then sends all of the relevant data direct to your smartphone via the Dyson Link app. 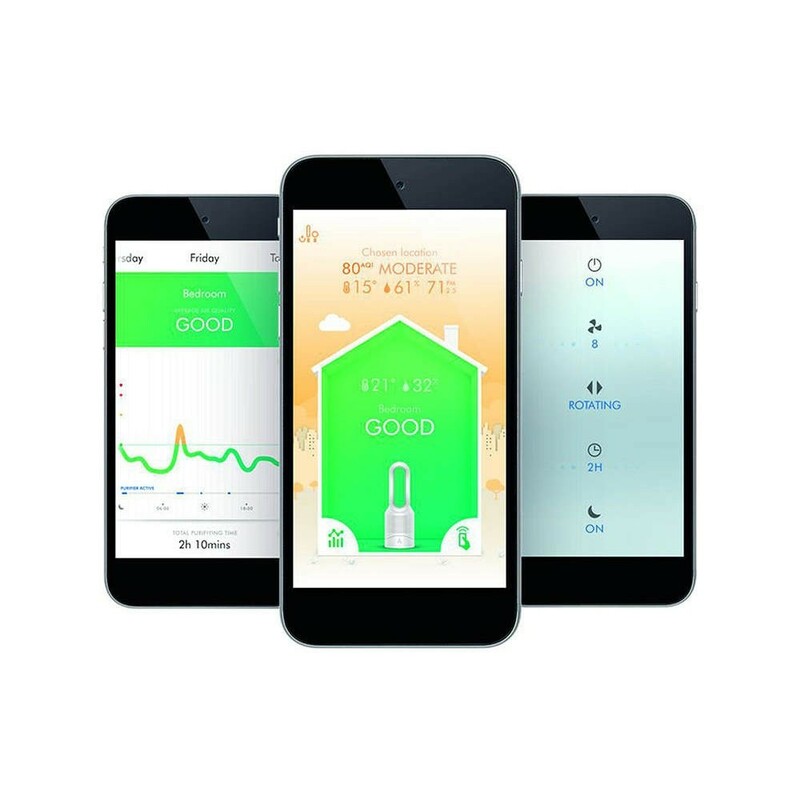 That way, you can keep track of things remotely, and ensure that you’ve always got a fresh room to come home to. 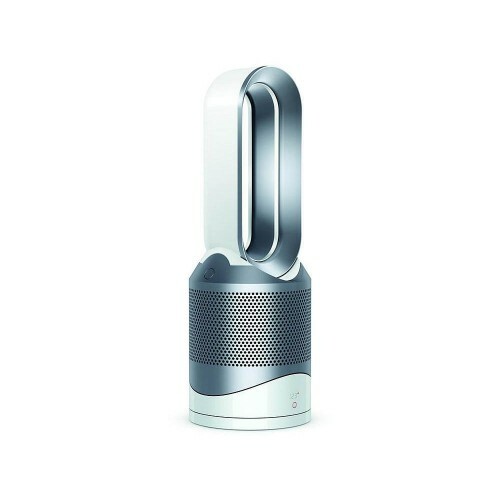 Dyson fans generally come with a distinctive hoop design, and the Pure Hot+Cool Link is no different. This is more than just an aesthetic touch, though. 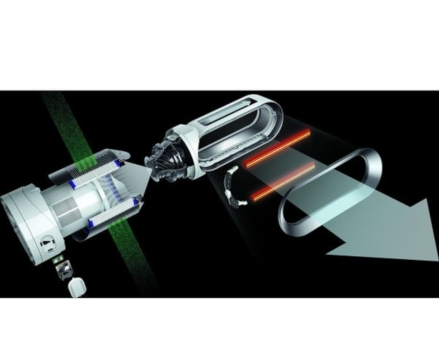 It keeps the crucial piece of equipment- the fan blade- hidden away from view, allowing Dyson to refer to their fans as bladeless. Not only does this make the Pure Hot+Cool Link safer to use, but it also means it is much quieter when in use. In fact, it is the only fan heater with Quiet Mark accreditation. Whether you’re watching TV or trying to sleep, you can be sure that the Pure Hot+Cool Link won’t interfere with your everyday life. Plus, to keep the unit nice and secure, the fan head pivots around its own centre of gravity to remain stable at all times. Although the Pure Cool offers a range of advanced features, it still manages to remain energy-efficient. For instance, with the heater mode activated, the intelligent thermostat constantly monitors room temperature. 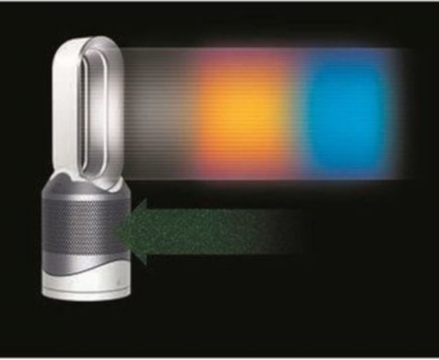 Once this reaches the target temperature, the heating element automatically shuts off. Not only does this save on energy, but it also prevents the room from getting too warm for comfort. When the temperature starts to drop, the heater will kick in again before you’ve even noticed a change. That adds up to a slick, seamless, and most importantly eco-friendly operation. To help you get a good night’s sleep, the Pure Hot+Cool Link comes with a built-in sleep timer. 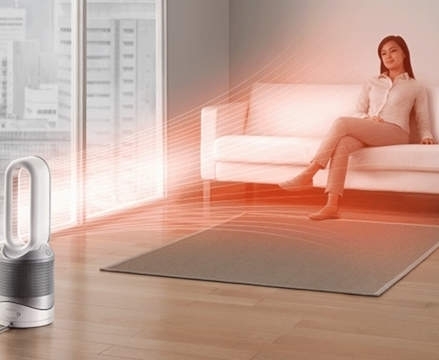 It’s simple to set this up, as you can do it either via the included remote control or the Dyson Link app. There are a range of pre-set timers to choose from, ranging from 15 minutes all the way up to 9 hours. From hot summer nights to cold, dark winters, the Pure Hot+Cool Link will keep you comfortable even after you turn the lights out.